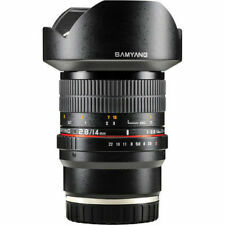 35mm T1.5 VDSLR II Lens for Sony E-Mount. To aid focus pullers who have to work both sides of the lens, the aperture and focus scales are marked on both sides of the lens. 35mm Lens, T1.5. Maximum: T1.5. SIGMA 19mm F2.8 DN | ART SERIES - INCLUDES BONUS 32GB SANDISK SD CARD. features a rounded 7 blade diaphragm creating an attractive blur to the out of focus areas of the image. This Sigma 19mm F2.8 EX DN has a minimum focusing distance of 20cm and a.
UMC lens coating facilitates even light transmission and reduces ghosting and flare. The minimum focus distance for this lens is 11". UMC lens coating allows even light transmission and minimizes ghosting and flare. HSM (Hyper-Sonic Motor) ensures a quiet & high-speed auto focus. F3.5 aperture throughout the entire zoom range and is perfect for low light photography. Super Multi-layer coating reduces flare and ghosting, four aspherical lenses provide correction for distortion and inner focusing System eliminates front lens rotation and suitable for use of polarizing filters. Samyang AF 35mm F1.4 FE (Sony E)  Lens (Sony E Mount). Its general wide-angle field of view suits photographing a wide variety of subjects and the fast f/1.4 maximum aperture benefits working in low-light conditions and also enables working with shallow depth of field techniques. MILVUS 18MM F/2.8 ZE LENS FOR CANON EF. CARL ZEISS. Our warranty covers labour costs for repairing the faulty unit. LOST PARCEL AND DISPUTE CASES. Maximum Reproduction Ratio. 9.84" (25 cm). Minimum Focus Distance. Fantastic lens, well looked after. Trending at AU $757.02eBay determines this price through a machine-learned model of the product's sale prices within the last 90 days. Carl Zeiss Sony Vario Sonnar T DT 16-80mm f/3.5-4.5 ZA. 91%, Excellent. Excellent 90-91% Show signs of moderate use. Excellent- 88-89% Heavy marked but works ok. Excellent-- 86-87% Heavy marked but works ok.
TAMRON SP AF 18-270mm f/3.5-6.3 Di II MACRO for Minolta. 92%, Excellent . Excellent 90-91% Show signs of moderate use. Excellent- 88-89% Heavy marked but works ok. Excellent-- 86-87% Heavy marked but works ok. The "F 1.4 he" our product line of type of. HSM ultrasonic motor (hyper Sonic motor) - HSM lenses a motor is used, which is driven by ultrasonic waves. Two different types of the HSM ultrasonic actuator are used in our lenses. Slightly white dirt is on rubber parts of a ring. I will look it for you. I will provide courteous and responsive service. Near Mint . I send a product by EMS. The lens is equipped with SIGMAs of own optical stabilizer (OS) function. (The effectiveness of OS decreases gradually at shorter distance.). The size of the subject and the image can be changed easily by rotating the zoom ring. Product model number SEL 28 F 20. Lens mount Sony E. Lens type Single focus lens. accessories Lens front cap, lens rear cap. type Wide angle lens. Focal length (wide angle side) 28 mm. Our products are 100% authentic. Product Line Tamron LD. Series Tamron LD. NIKON LENS. New Nikon Parts. KODAK LENS. CANON LENS. SAMSUNG LENS. CASIO LENS. Near Mint! Tamron AF 18-200mm f/3.5-6.3 XR Di II LD for Sony A-mount. There are no mold or cloud inside the lens. Condition Grade Near Mint! Near Mint It is used,but there are few sign of use. Mint It is used,but there are almost no sign of use. The 35mm F 1.4 DG HSM | Art is the first lens of the art product line. The lenses designed first and foremost to images with artistic touch our designed this product line for those who appreciate a creative, dramatic result more than compactness and versatility. 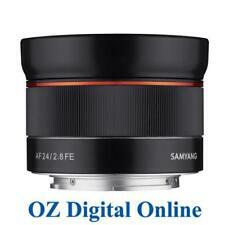 SONY SEL1855 18-55MM F/3.5-5.6 OSS Lens. This is a Used SONY SEL1855 18-55MM F/3.5-5.6 OSS Lens. MPN SEL1855. Our products are quality assured! Mount Sony E-mount. Focal Length Type Zoom. Series Sony SEL. SONY A MOUNT LENS. Lens Mount Sony A. Lens Type Standard Zoom. Minimum Aperture 22. Focal Length – Wide (mm) 16. EXCELLENT CONDITION. THIS IS A USED ITEM. Filter Thread Size (mm) 62. You can expect a fully-functional unit. MPN SEL16F28. KODAK LENS. CANON LENS. SAMSUNG LENS. NIKON LENS. CASIO LENS. Focal Length 16mm. For E Mount SEL35F14Z. - Autofocus : Yes. - Focal Length : 35mm. -Direct Drive Super Sonic Wave AF System. - Magnification : 0.18x. -Aperture Range: f/1.4 to 16. - Angle of View : 63°. Full Panoramic Capability. 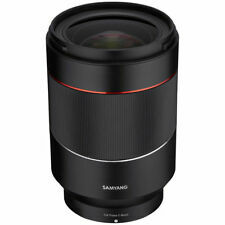 1.1 x High Quality Wide Angle & Macro Lens. Mounts on any lens with 55mm filter thread - no adapter needed. Great for landscapes or recording in situations. 10.62mm Front Thread for Filter Mounting. Works Great! In Good Condition! Shows Some Used Signs of Wear. Include lens hood and front cap only. Please Refer to The Pictures. This unit has been thoroughly inspected, repaired and tested by our in-house, factory-trained technicians. As a result of the technicians' professional handling and care, the unit has been returned to factory specifications. You can expect a fully-functional unit. Works Great! In Very Good Condition! Shows Some Used Signs of Wear. Please Refer to The Pictures. This unit has been thoroughly inspected, repaired and tested by our in-house, factory-trained technicians. As a result of the technicians' professional handling and care, the unit has been returned to factory specifications. You can expect a fully-functional unit. 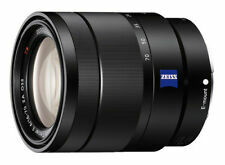 Sony DT 18-250mm F3.5-6.3 ZOOM LENS SAL18250. Sony DT 18-250mm F3.5-6.3 ZOOM LENS SAL18250 This unit has been thoroughly inspected, repaired and tested by our in-house, factory-trained technicians. You can expect a fully-functional unit. It features a large maximum aperture of f2 which in combination with the 9-blade circular aperture creates beautiful defocus effects. Focal Length 24mm. This includes sealed boxes, or sealed accessories and manual/software included in boxes. Series Minolta Maxxum. Lens works good. Focusing works good. Zoom works good. Mount Sony Alpha A. It shows light if any wear on the lens barrel from use. I don't see any scratches on the plastic parts or glass. Series Konica Minolta Maxxum. Product Line Konica Minolta Maxxum. Model Minolta Maxxum 70-210mm F4.5-5.6. I would rate lens at 9 or near mint out of 10. All lenses features work good. Aperture blades are free of oil. For sale is Used Maxxum 28-85mm f3.5-4.5 SN 1005084 lens. I would rate it at 8 on a scale form 1 to 10. Lens looks very nice and works good. Series Konica Minolta Maxxum. Model Minolta Maxxum 28-85mm f3.5-4.5 AF.